6/0 Uni Pre Waxed Thread - 200 yards - A hugely favourite tying thread. 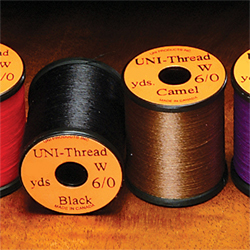 The 6/0 Uni Pre Waxed Thread is bright coloured and very strong, a must for your fly tying material collection.There are two ways to evaluate thread size (in the majority of cases) the 'ought' method, or the denier method.The 'ought' - as the number decreases the thickness of the thread increases. E.G. 8/0 is thinner than 6/0The Denier system as the number increases the thread thickness increases. E.G.70 Denier Thread is thinner than 210 denier thread.Comparing the two systems is impossible until you come to physically use it and compare yourself. To further confuse, two manufactures using the 'ought' system may well have different thicknesses for the same 'named sized thread' making the whole process arbitrary. Denier however seems accurate between manufacturers.To give an overall start and to help as a guide:3/0 Big Fly Thread: Largest thickness thread for fly tying large saltwater flies, lure flies, or using as a floss substitute for bodies and ribs. In summary, any large fly where you need the thread to be very bulky.6/0 Uni Thread. By far the best selling thread as it covers a large amount fly patterns in the range of #2 to 16# hooks.8/0 Uni Thread. Another huge seller and ideal for smaller flies, or dry's where you do not want to bulk up your pattern. Best for dries, nymphs and midges. Again a rough guide would be hooks size circa 12# / 14# to the smallest hooks.